We all know that collaboration is key in product development. We need to consistently send engineering changes and updates to the rest of our team – who is also working on the same task. We are all trying to complete the current task as quickly as possible, with zero errors. This is nearly impossible if we continuously try to work alone – trying to send information over the proverbial wall. But collaborating efficiently and effectively with our electrical counterparts is an effective way to reach our goals. The mechanical and electrical engineering disciplines have been limited in their collaboration and communication with one another by technology, inadequate interchange formats and even culture within organizations. 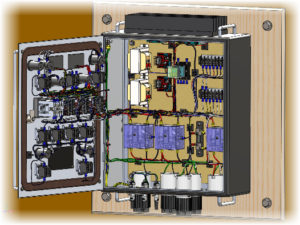 SOLIDWORKS’ suite of highly integrated electrical and electronic design tools can help streamline communications and facilitate collaboration between MCAD and ECAD disciplines. Employing the same associative and parametric design principals across all engineering disciplines is vital to drive down product development time and cost. The SOLIDWORKS ECAD Solutions Technical Team is holding two distinct mini-series webinars: one for SOLIDWORKS Electrical and the other mini-series is for SOLIDWORKS PCB. It’s not too late to sign up for the two remaining live webinars, providing a deeper dive into the software to show you where you can gain value and make you and your team’s collaborative experience even better. In addition, we will have several subject matter experts involved during each webinar and are available to answer your questions and show potential solutions live during the webinar. To register for these sessions, click here. Have more questions about how SOLIDWORKS Electrical can help your product development team? Click here and an expert from The SolidExperts will be happy to help you!